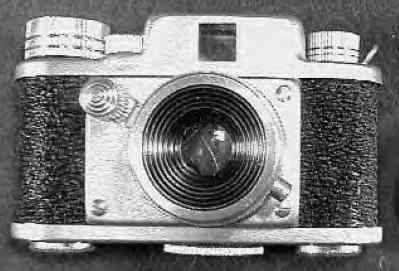 -- (1955) Camera shaped like a small Leica. Fixed focus 30mm (f11.0) lens. Despite its name, it used 17.5mm film. Three versions were made, all apparently in the same year. The original has two speeds -- B and 1/30. Accessories were made, such as a tiny tripod. 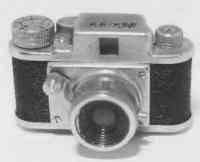 -- (1955) Camera shaped like a small Leica. Fixed focus 30mm (f11.0) lens. Despite its name, it used 17.5mm film. Three versions were made, all apparently in the same year. The original has two speeds -- B and 1/30. The model II dropped the B setting, but a film counter was added. Accessories were made, such as a tiny tripod. 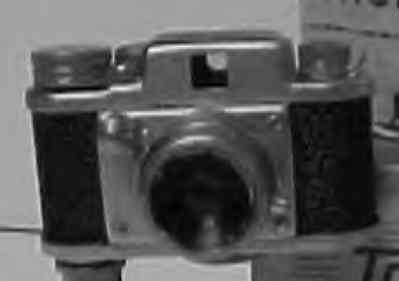 -- (1955) Camera shaped like a small Leica. Fixed focus 30mm (f11.0) lens. Despite its name, it used 17.5mm film. Three versions were made, all apparently in the same year. The Kute was the final model. It was the same as the Toyoca 16 (model II) but with a different nameplate. If you have any ideas, suggestions or comments about these pages, please contact the Sub Club at the FRONT DESK. To return to the main index for the Sub Club click here. COPYRIGHT @ 1995, 1996, 1997, 1998, 1999, 2000, 2001, 2002, 2003, 2004, 2005 by Joe McGloin. All Rights Reserved.